Money as a medium of exchange has closely reflected the complex evolution of the Filipino nation from small seafaring communities to today's modern state. The Bangko Sentral ng Pilipinas Museum welcomes all visitors and hopes they will enjoy this rich insight into the national heritage. Money Museum (Museo ng Bangko Sentral ng Pilipinas) opened 4-January-1999 during the 50th anniversary of the Bangko Sentral ng Pilipinas. It traces the development of coinage, paper money and banking in the Philippines from the earliest times up to present. The collection also contains an exhibit contemporary foreign currency. Opens Monday to Friday from 0900H-1200H / 1300H-1600H (except Saturdays/Sundays and holidays). Wearing ballcap, flash/commercial photography, videography and monopod/tripod are NOT PERMITTED inside the museum. Basic photography coming from mobile phone/digicam/DSLR is PERMITTED. Free Admission to all. From LRT1 line, the nearest is Vito Cruz station. 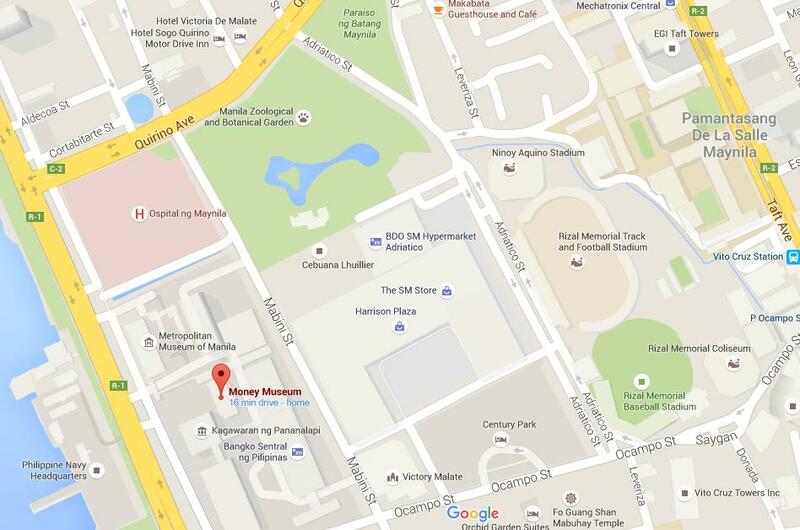 For vehicles coming from Quiapo, museum building is located right after the Manila Zoo. For vehicles coming from EDSA/Baclaran, museum building is a walking distance from De La Salle University. Money Museum address is BSP Compound, Mabini St, Manila.